The weather was warm and sunny, but we had put off museum day too long, so we decided to head to the Van Gogh museum, one of our high-priority destinations. I had grabbed one of my short-sleeve shirts to wear, a light pink one, which was an unfortunate decision, but more on that later. We took a tram, of course, to the Van Gogh museum. By now, we were getting pretty good at using the tram system with the city map. The museum is housed in a bland, nondescript, boring, 1970's style concrete, rectilinear building that is entirely at odds with what it houses. We walked right past the long line of people waiting to buy tickets, because we had asked our desk-clerk if there was a place to buy tickets that allowed you to avoid waiting on line (quite a few European museums have this). He smiled, opened a drawer, and sold us two tickets, charging them to our room bill. Inside, the museum is still rather nondescript and boring architecturally, but the pictures! The pictures! Van Gogh painted 900 paintings in his short career and made over 1000 drawings. 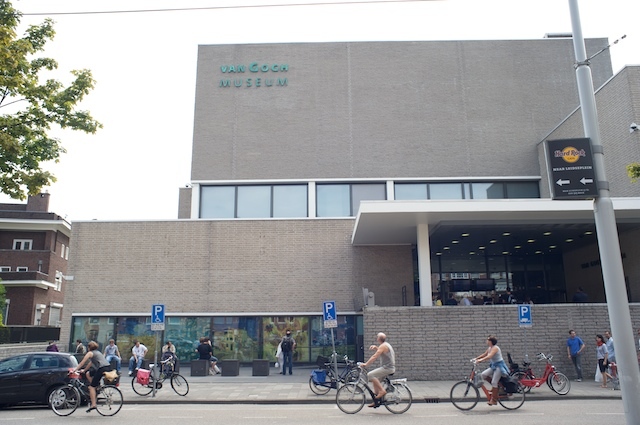 The Van Gogh museum has the world's largest collection of his paintings, over 200, and a very large number of drawings, but the drawings were not on display. We walked slowly through the museum, stopping to look at each and every painting, and then went to the center of each room to view the paintings from afar. They were all magnificent. We didn't see a single one we didn't like. At one point, I pointed to a painting and said, "That's very Renoir-like". Three points for Jeffie. It WAS a Renoir! It was there on loan to show the relationship of Renoir's views of the Seine and Van Gogh's. We saw many Van Goghs that we had never seen before, even in books, and quite a few that were famous. It was a great experience. It was also very sad to read the signs talking about his bouts of mental illness. They said it was probably caused by epilepsy. It was amazing to see the incredibly beautiful paintings he created just a few days before he became so depressed that he shot himself. It was also interesting to find out how serious, and hard working he was. He spent a lot of time learning how to paint, experimenting with various techniques, sketching, drawing, and attempting to learn from other artists. It was also interesting to learn that his nephew, his brother Theo's son, who was born during the same year he died, was named after him. The nephew and his mother, Theo's widow, were the ones who worked to make Vincent famous. The nephew was the founder of the museum. After the museum, we decided to go to an area called Neuwmarkt, which involved two trams and a subway ride. After taking the first tram, we were in an area full of outdoor cafes and pubs, and decided to have lunch before continuing. We were sitting at the outdoor cafe, waiting for our lunch to arrive, when we noticed, very close to us in the area between two cafes, a very small cart, out of which was extended a long pole connected to some overhead wires. Dangling from the pole was a heavy rope, and attached to the rope were some hand-grips. This was very curious. After a few minutes, an older man, maybe 70 years old, walked up to the cart, opened the box, and began fiddling with things in it. Then he tried to get the attention of the people in the cafes by waving his hands around. Then, he took off his shoes. Then, he took off his shirt, showing an old, but muscular chest. Then, he took off his pants! He was wearing a very small bright green thong underneath (thank goodness!). He then proceeded to climb the rope and perform an aerial act, taking various difficult and dangerous positions in the air, while hanging from the rope. Afterward, still dressed only in his thong, he walked among the cafe tables accepting coins from the crowd. Then he went back to his cart, dressed, and walked away. A few minutes later, in almost the same place, a group of Latin-American-looking musicians arrived, including a saxophonist and bass-fiddle player, and played everything from "La Bamba" to cool jazz. After the interesting lunch, we took the next tram to the subway stop, and took the subway. Since the trams, and trains and buses we had taken were all very clean, we were a bit surprised to see the insides of the subway cars were not as clean and filled with graffiti. When we got to our destination, we saw a large number of people, about a block away, standing on one of the many bridges over the canals. We knew why they were there. 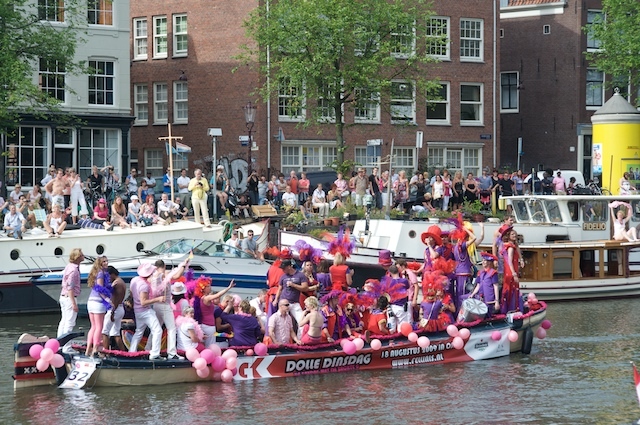 This was "Gay Pride" weekend in Amsterdam, and we had heard that today a parade was scheduled. There were many, many people wearing Pink! Oops! I should have worn a different color shirt! We had originally decided to try to avoid the crowds, but Donnie suggested we go take a look. The canals and bridges were lined with tens of thousands of people. The parade was taking place on the main canal, and was made up of boats and barges, lending new meaning to the phrase "parade float". The parade boats had people in outrageous costumes, with loud music. There were many people in the crowd dressed outrageously also with colorful hats, feather boas, t-shirts, etc. 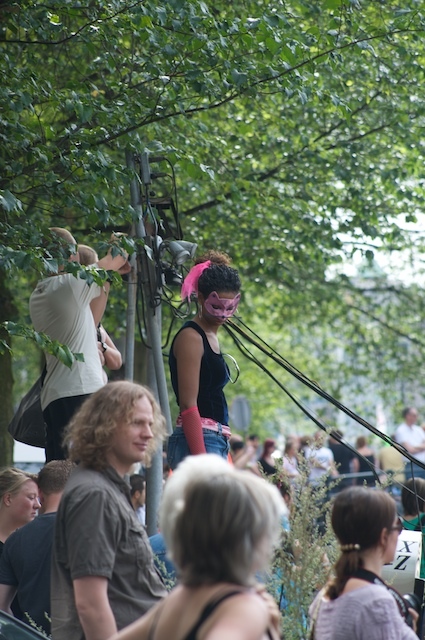 We wandered around for a while in the crowd, taking pictures and watching the parade. Then, the parade started to wind down, as did we, so we decided to find a cafe for a cool drink. Since the whole area was jammed with people, it took a while to find a cafe with some empty seats, but we finally did. We then decided to walk past the Oude Kirk (Old Church) which we had intended to visit some time during the week. The Oude Kirk sits in the middle of the famous Red-Light district, which we had avoided up to this point. 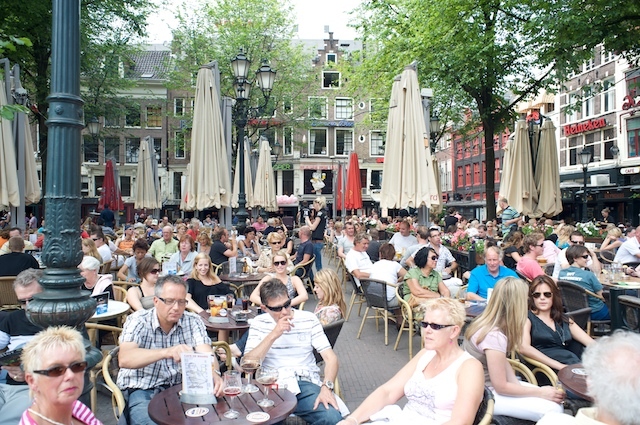 The guide book said that the streets directly around the Old Church were a "quiet oasis" within the Red-Light district. The guide book was wrong. There were several establishments directly opposite and around the Church, including one or two that were open for business, with the ladies displaying their wares. They literally had red fluorescent lights above the windows. We walked through the area, and then we walked down another street, and discovered we were in "Chinatown". This was a street, three or four short blocks long, full of Chinese restaurants and shops, and a small Buddhist temple. We were very tempted to stop and eat there, but we weren't really very hungry. We walked back to the hotel, rested for a while, and then went to dinner around 8:30. We weren't sure where to eat, and wandered around a bit, until about 9:00 and we ended up in an Indonesian restaurant. 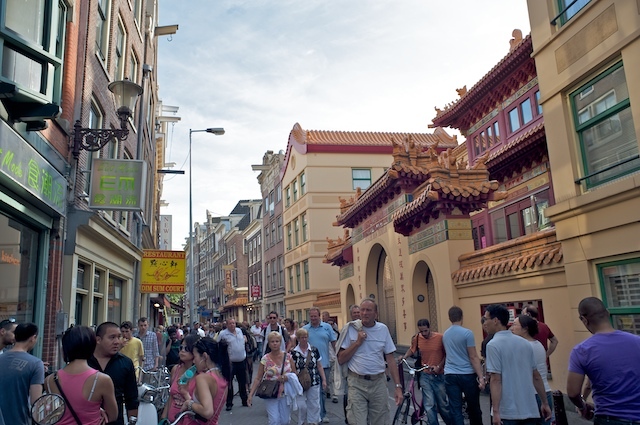 Amsterdam has restaurants of every cuisine in the world. There are lots of Dutch restaurants, of course, and a lot of Indonesian places, since the Dutch were once the colonizers of the Dutch East Indies, now Indonesia. There are also Chinese (spelled Chinees in Dutch), Malaysian, Italian, quite a few Irish Pubs, a lot of Argentinean restaurants, for some reason, and almost anything else you could imagine. After dinner, at about 11:00, we went to O'Reilly's Irish Pub for some pear cider! It was a very busy, but fun day. Sunday, August 2, our last day in Amsterdam was a quieter, "down" day for us. 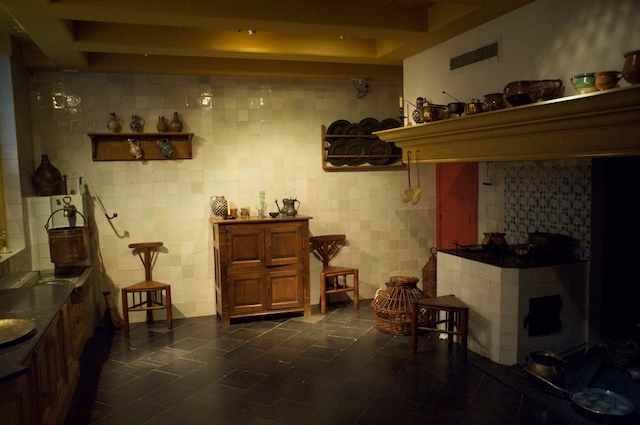 In the morning, we went to Rembrandt's House, which is really the house he lived and worked in for much of his career. The house and all of his belongings were sold at auction when he had financial problems, but the inventory of his belongings survived, along with drawings of what some of the rooms looked like, so they have re-created several rooms to look the way they did when he lived there. The most impressive room was his studio, which had an easel in the same place that Rembrandt did, and all kinds of interesting objects in the room. We weren't allowed to take pictures, so my shutter finger was twitching. 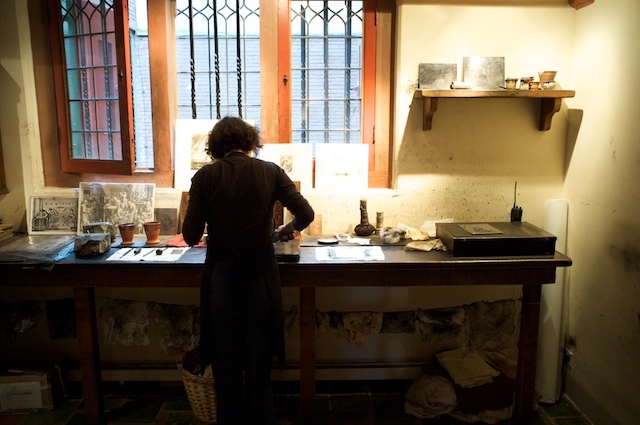 In another room, the room he used to make prints, a young woman explained and demonstrated print making and explained the difference between engravings, dry-point, and etchings. 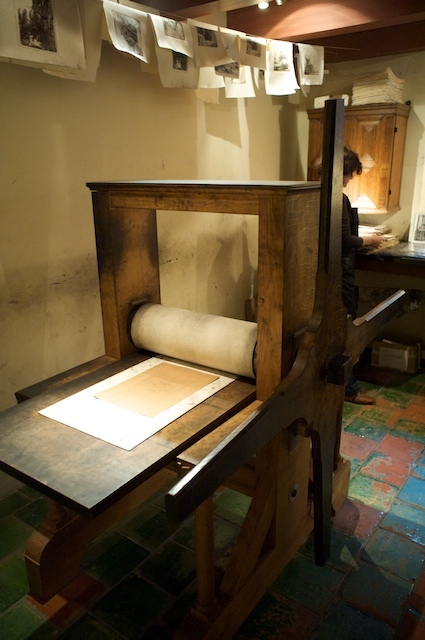 The Rembrandt House has a large collection of his prints, and we found out that during his life, he was more famous as a print artist than as a painter. The prints were fantastic and I think maybe more beautiful than the paintings. The detail in them was amazing. There is a famous self-portrait, that the Rembrandt House uses as a logo, that shows him as a young man with a surprised look on his face (It reminds us of Harpo Marx!). The actual print is tiny, maybe an inch by an inch-and-a-half, and incredibly detailed. After the museum, we walked to the Neuwmarkt area, and wandered around a small flea-market. Then, since it was lunchtime, and we were nearby, we decided to go to Chinatown for a Dim-Sum lunch. We went to the "New King" restaurant, and had soup and Dim-Sum, which was very good. After lunch, we walked around some more, stopped in a cafe for some coffee and we shared a piece of delicious raspberry tart, and then went back to the hotel in the late afternoon, to chill out, pack, write this episode, and prepare for tomorrow. Tomorrow we have to get up early, check out of the hotel, take a short tram ride to the central station, and take a 4-hour train ride to the Gare Du Nord train station in Paris, where we pick up a rental car we have reserved, and then we drive 4 hours to Mont St. Michel where we have a hotel booked for 2 nights. So tomorrow will be a long, probably tiring day.